This post is a quick walkthrough of implementing Twitter OAuth, complete with a working demo. I've been working on a project with my Analog friends that might use the Twitter API to streamline stuff like signup for those who already use Twitter. Because this now requires OAuth, I needed to implement OAuth quickly, so that we had something to test and consider. As with all things related to developing with Twitter, my first step was to seek advice from my good friend Ed Finkler. Without hesitation, he recommended a PHP library developed by Abraham Williams, so I tried it out. A few minutes later, I had it working. Follow along, and I'll show you how. First, download the library. (I used the latest version, 0.2.0-beta3.) Abraham has some handy documentation, but I learned everything I needed from the sample implementation he bundles with the download. Before you can get the sample implementation working, you need to get yourself a consumer key and consumer secret. Twitter has a page where you can manage your existing apps or register a new one. If you're completely new to all of this, you may not understand everything Twitter is asking for. Don't worry, because you can edit this stuff later. Also, the callback URL is something that you can override in your code. Once you have the library downloaded and your app registered with Twitter, you're ready to write some code. Before you do, I think it's a really good idea to try to get the sample implementation working. To do this, edit config.php to define the consumer key and consumer secret you got from Twitter. The callback URL just needs to be a working URL for the included callback.php. With the configuration updated, you should be able to try it out. Getting it working quickly is fun, but the real fun is doing something useful. For years, I've used OpenID on this blog for authentication. I am strongly considering replacing it with Twitter OAuth. To do so, I just need is to be able to verify that someone is who they say they are on Twitter. // 1. Get request token. // 2. Keep the request token in the user's session. // 3. 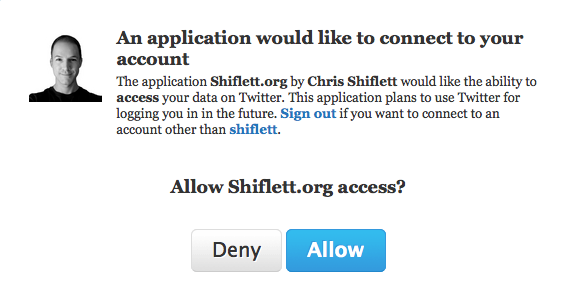 Redirect the user to Twitter for authorization. // 4. Get access token. // 5. Discard request token. Whatever your storage system may be, you'll need to begin storing an oauth_token and oauth_token_secret (collectively, an "access token") for each user of your application. The oauth_token_secret should be stored securely. Remember, you'll be accessing these values for every authenticated request your application makes to the Twitter API, so store them in a way that will scale to your user base. When you're using OAuth, you should no longer be storing passwords for any of your users.